How one medical student’s anatomy classes helped him learn to love liver. Does understanding what an organ does in the body make it taste better? For this medical student, it did. Liver simply was not something I ate. And then I went to medical school. 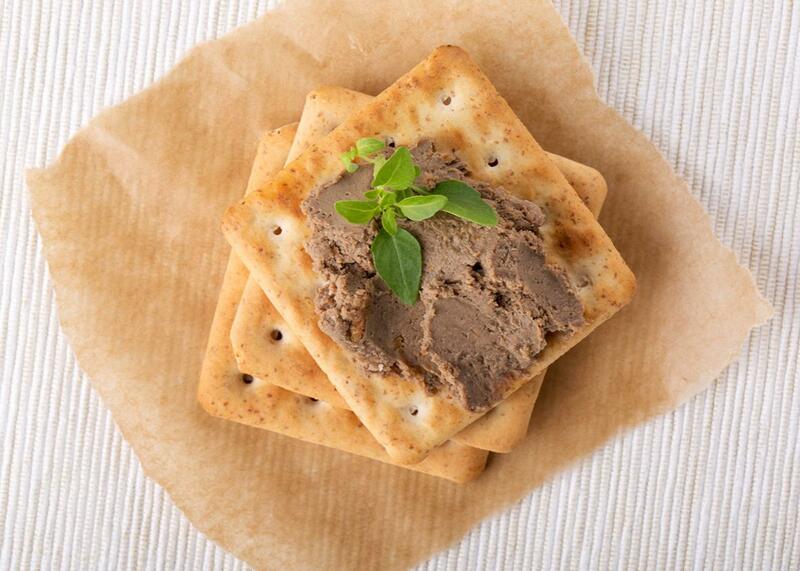 Chopped liver was a holiday staple in my house growing up, a beloved spread enjoyed on occasions both religious and secular. I alone in my family found it utterly repulsive. The drab beige color highlighted by a repellant pink, the granular texture, and its metallic tang of putrefied iron had revolted me since early childhood. It simply was not something I ate. And then I went to medical school. As a child I never really thought about what liver was, never considered its origin inside some animal’s abdomen before it sizzled beside onions in my mother’s frying pan. My revulsion was a thoughtless, programmed reaction to the sight, smell, and taste of something I considered to be conclusively and immutably gross. But then I encountered the purple and glistening liver in anatomy lab. Perched in the upper-right-hand corner of my cadaver’s abdomen, it seemed to be lording over all of the other digestive organs in its purview. In pathology class I examined the liver’s thousand macroscopic and microscopic facets, handling preserved specimens and studying microscope slides that revealed the organ’s cellular architecture. And in biochemistry class I memorized the liver’s elaborate and hegemonic control over many of the body’s intricate biochemical balances. My enchantment with the organ grew. When I went home for Thanksgiving dinner in the second year of medical school, a bowl of chopped liver sat in its usual place on the table beside slices of turkey meat and cranberry sauce. I watched my gleeful relatives lavishly spreading their blessed mayonnaise-infused muck over crackers. It struck me that this dish was made from the same organ with which I was now intimately familiar. After weeks of studying for exams, my head was fattened with information about the liver’s structure and function, oversaturated like a goose’s liver bound for foie gras. The thought of all that staggeringly complex biology becoming simple food seemed a magical and surprising transformation. I felt an urge to try it. So, I smeared a spoonful across a cracker and brought it to my mouth as memorized diagrams of the liver’s glucose production and venous drainage swirled through my mind. Fighting through its dog food smell and my ingrained disgust, I shoved the cracker into my mouth. Its organ-y taste of minerals and meat was not as offensive as I had remembered. I swallowed without gagging and reached for another cracker. And another. It was certainly not love, but the spread’s curious connection to what I knew of living livers enchanted me. Over the years, I’ve come to enjoy liver on holidays along with the rest of my family. But it didn’t stop at the holiday dinner table. My liver flirtation spurred a growing anatomical appetite that ventured into other parts of the medical corpus. In the midst of studying nephrology, I tried steak-and-kidney pie at a local British restaurant. The millions of microscopic blood filters, or glomeruli, that filled the organ’s flesh made it substantial and surprisingly chewy. Later, I sampled pancreas sweetbreads for the first time while learning endocrinology—an organ essential for digestion and sugar control that is typically discarded as offal, it was flavorful and filling as it entered into my own digestive tract. And soon after learning in an immunology lecture that an astonishing 100 billion immune cells pour from bone marrow into the bloodstream every day of our lives, I tried roasted marrow bones and finally realized why my immigrant grandmother had been so fond of them: This life-sustaining substance was equally delicious. Studying medicine broadened my culinary horizons and showed me that knowledge mixed with awe at the body’s physiologic harmony were consummate flavorings. The most anatomical meal of my life came during a trip to Iceland. While visiting a friend outside of Reykjavik I was served svid, a traditional Icelandic dish. I was handed a dinner plate and staring up from it was a sheep’s head split down the middle from front to back. The exposed cross section of the face was an image straight from my anatomy textbook: For weeks I had studied that same diagram (though human rather than ovine) leading up to a medical school exam. I recognized the same eyeball sitting couched in its orbital adipose and wrapped with miniature eye-swiveling muscles. The serpentine nasal passages lined by paper-thin swirls of bone exposed on my plate were the same ones I had navigated again and again in my mind, learning each detour to the middle ears and sinuses. And the animal’s muscular tongue flung against a row of teeth recalled my delight at first learning from my cadaver how the tongue is attached in the throat—a mystery I had pondered since childhood. My comfort eating animal liver and kidneys had not quite prepared me for having a face on my plate looking back up at me. More than abdominal organs or cuts of meat, a face invoked the life that sheep had lived and bluntly told of what it had taken to make that meal. With my fork I poked at the pearl-colored stump of optic nerve protruding from behind the sheep’s eyeball, the olfactory nasal mucosa, and the taste buds cobblestoning its tongue—these sensory organs and the exposed nerves wiring them to the brain had captured a lifetime of sights, smells, and tastes for that sheep. With the dinner plate as a mirror, I thought about what lay behind my own face. My own senses and their circuit boards of perception had captured every experience of my life. Yet the svid suggested that I, too, would one day end up on the dinner plate of some creature, be it large or microscopic, everything I touched and saw reduced to little more than chopped liver. Considered from the rigid science of anatomy and physiology, the death through which a living sheep turned into Icelandic dinner was no different from the death I would spend my medical career fighting against, or easing. With empathy added to taste, I savored every bit of the svid. Its eyeball fat was soft and luscious while the muscles of mastication strapped to its jaw, so impossibly tender, were soft enough to be slurped. Reducing life’s beautiful complexity to food, like reducing the emotion of love to a mere trick of the reproductive drive, seemed no reduction at all. Besides, biologically speaking, every single part of an animal’s body is edible as long as it can be chewed without fracturing a tooth and swallowed without stabbing you in the esophagus—and even those inedible parts make a good broth. Every culture, whether Icelandic or American, and every person, has a unique definition of edibility and a different perspective on gross. Many feel that the worlds of anatomy and appetite must remain utterly severed from each other if the latter is to survive—that meat’s animal origins should be kept out of mind in order to enjoy the meal, and I felt the same way before attending medical school. Meat was the abstracted, disembodied slices of substance swaddled between Styrofoam and plastic wrap on supermarket shelves. I had little knowledge of food’s origins and was blissfully unaware of its sometimes gory provenance, protected by my own narrow perception of edibility. Medical school broadened my ingrained habits of edibility and cleansed the doors of my culinary perception. And, as William Blake might have said, when the doors of perception are cleansed, one may see things as they truly are—delicious.